The 4th edition of Nairobi Fashion Week (NFW) will be held in November 25th & 26th at the Concord Hotels with the main shows proceeding at 7.00 p.m-10.00 p.m of both nights. The bar has been set high for designers showcasing at NFW over the years and this year’s show will maintain the standards. 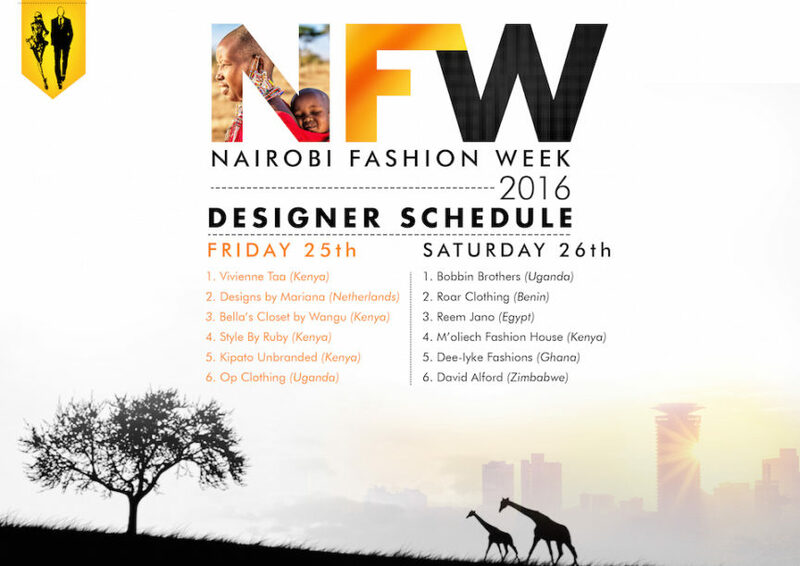 The rebranding of the NFW pop up shops shows Nairobi Fashion Week’s commitment to the promotion and sales of the Africa’s design industry as an important economic activity. This year’s event theme dubbed ‘Mama Africa’ seeks to empower the African continent through fashion by portraying Africa’s self-sustainability, hard work, resilience and its natural beauty. This year’s Summer/Spring edition will bring together fashion designers from Netherlands, Uganda, Egypt, Ghana, Benin, Zimbabwe and Kenya the host. Vivienne Taa from Kenya is set to open the show while while fashion enthusiasts utilize the on-site designer pop up display stands, viewing and buy their ￼favorite pieces.